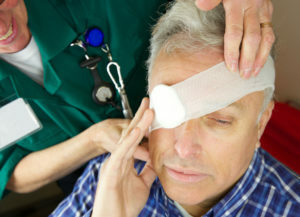 Home » Blog » It’s Eye Injury Prevention Month! Do you Know your Risks? The American Academy of Ophthalmology recently conducted a survey in which respondents were asked where they might expect a serious eye injury to occur. Less than half of respondents’ answers included anyplace related to home, including the garage or yard. Another alarming statistic was discovered during this survey: less than 40% of those polled reported wearing protective eyewear at home, even in the garage and the yard. Statistics obtained from medical records reflect a very different reality than what the AAO survey observed. In contrast to widespread belief that the home is a relatively safe place regarding eye injury, medical statistics reveal that approximately half of all eye injuries treated annually occur at home. Furthermore, such injuries are on the rise. Bleach and other chemicals used for household chores (more than 100,000 eye injuries each year are attributed to cleaning products). The cork from a champagne bottle. Hammering or drilling into hard surfaces. This may release fragments of material that enter the eye. These are only risks that are inside the home. Outside, or in the garage, there are several more. For instance, one should not mow the lawn without wearing protective glasses. Rocks or other objects may be catapulted from the mower, landing in the eye. Some eye injuries have reportedly occurred while trimming hedges, due to a rogue leave or fragment of plant entering the eye. Eye injury prevention is an important topic of discussion. Generally speaking, any work that is done around the house, in the yard, or in the garage or workshop, should be conducted with appropriate eyewear. Chemical cleaning solutions should not be mixed, and grease shields or lids can minimize the risk of hot oil leaving the pan. In the event of an eye injury, contact your local emergency room or urgent care clinic. If you have questions about eye injuries, we are happy to speak with you. Contact our Canfield, North Canton, or Alliance office for friendly assistance.